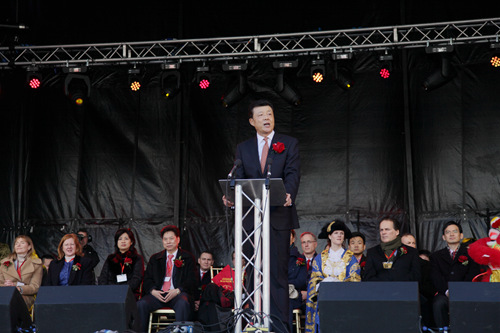 I am truly delighted to once again join you in celebrating the Chinese New Year in Trafalgar Square. The Chinese New Year is also known as the Spring Festival. In China for thousands of years this has been the most celebrated and ceremonious festivity. The Spring Festival symbolizes the arrival of spring. It is a time for renewal. It is a time for family reunion. It is a time to exchange best wishes. The Spring Festival has reached beyond China. It is now a jubilant occasion in Britain. Its influence travelled beyond the China Towns in UK cities and become a common festival of both Chinese and British people. From London to Edinburgh, from Cardiff to Belfast, streets have been lit with lanterns and fireworks. House entrances have been decorated with Chun Lian. These are the uplifting messages written on red paper in calligraphic style. But, for 14 consecutive years this Trafalgar Square celebration has led the way! Here is the biggest Chinese New Year celebration outside of China! The evolution of Chinese New Year celebrations in Britain reflects the deepening of China-UK cultural links. Both China and Britain have proud cultures. More importantly both our countries are eager to learn from other cultures and made our contributions to human civilization. At present there are almost 100 cultural projects exchanged every year between our two countries. These exchanges have greatly promoted mutual understanding and friendship between our peoples. The immense popularity of the Chinese New Year in Britain also mirrors the dynamic growth of China-UK relations. China and UK are both countries of global influence. If we strengthen the China-UK comprehensive strategic partnership based on equality and win-win cooperation we will all gain. We will not only bring benefits to our two peoples but also promote world peace and prosperity. I want to take this opportunity to thank artists from the Chinese Culture Ensemble and Happy Spring Festival Ensemble. They have contributed brilliant performances! I wish to thank the Greater London Authority and Westminster City Council for their support. Also I applaud the London Chinatown Chinese Association for their excellent organization and all sponsors for their generosity. Many others deserve warm thanks for their hard work. To all of you - thank you for making today’s event so successful! 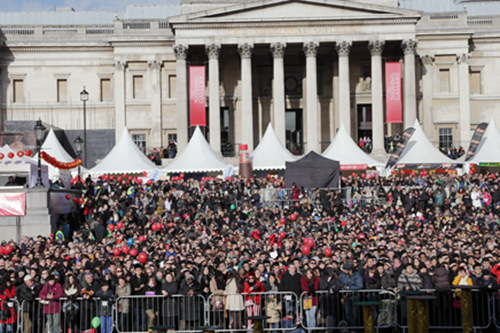 Thank you for making Chinese New Year celebrations in Britain such a celebrated carnival. According to Chinese lunar calendar, this year is the year of the Horse. In Chinese culture the horse symbolizes strength, progress and success. I wish you all a healthy, prosperous, happy and successful year of the Horse!